In the general settings, you’ll want to expose the daemon without TLS. This step is necessary so that the daemon listens on a TCP endpoint. If you don’t do this then you won’t be able to connect from WSL. You may also want to share any drives you plan on having your source code reside on. This step isn’t necessary but I keep my code on a regular HDD, so I shared my “E” drive too. Can’t use Docker for Windows? This is only necessary if you are NOT running Docker for Windows! No problem, just configure your Docker daemon to use -H tcp://0.0.0.0:2375 and --tlsverify=false. Then you can follow along with the rest of this guide exactly. This will install the edge channel, change ‘edge’ to ‘stable’ if you want. You may also want to update the Docker Compose version based on the latest release. # Environment variables you need to set so you don't have to edit the script below. # Update the apt package index. # Install packages to allow apt to use a repository over HTTPS. # Add Docker's official GPG key. # Pick the release channel. # Install the latest version of Docker CE. # Allow your user to access the Docker CLI without needing root. At this point you must close your terminal and open a new one so that you can run Docker without sudo. You might as well do it now! 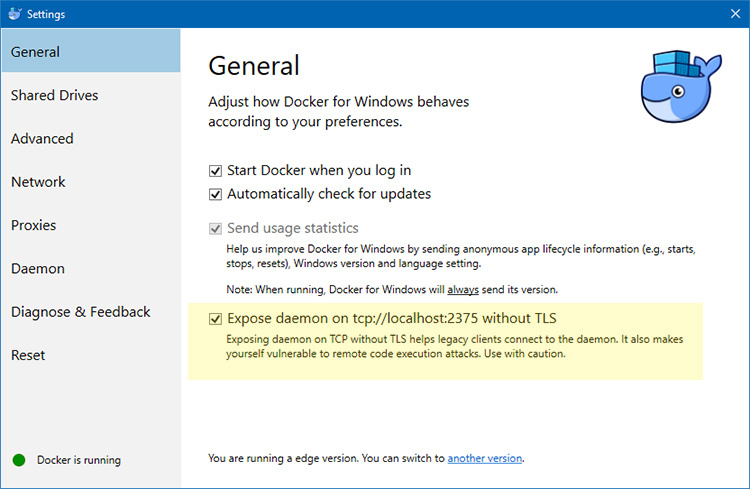 The next step is to configure WSL so that it knows how to connect to the remote Docker daemon running in Docker for Windows (remember, it’s listening on port 2375). Logout of your WSL shell and come back in, or run source ~/.bashrc to reload it now. You can verify it works by running docker info. You should get back a list of details. If you get a permission denied error then make sure you log out and log back in, because that’s necessary to apply the changes so non-root users can run Docker. That’s what the sudo usermod bit of the long command did in the command chain when installing Docker. When using WSL, Docker for Windows expects you to supply your volume paths in a format that matches this: /c/Users/bcochran/dev/myapp. But, WSL doesn’t work like that. Instead, it uses the /mnt/c/Users/bcochran/dev/myapp format. To get things to work for now, you need to bind a custom mount for any drives that you shared with Docker for Windows. You’ll want to repeat those commands for any drives that you shared, such as d or e, etc..
Verify that it works by running: ls -la /c. You should see the same exact output as running ls -la /mnt/cbecause /mnt/c is mounted to /c. You can use volume mount paths like . :/myapp in your Docker Compose files and everything will work like normal. That’s awesome because that format is what native Linux and MacOS users also use. It’s worth noting that whenever you run a docker-compose up, you’ll want to make sure you navigate to the /c/Users/bcochran/dev/myapp location first, otherwise your volume won’t work. In other words, never access /mnt/cdirectly. You can do that with this 1 liner: echo "sudo mount --bind /mnt/c /c" >> ~/.bashrc && source ~/.bashrc and make sure to repeat the command for any additional drives you shared with Docker for Windows. By the way, you don’t need to mkdir because we already did it. To do that, run the sudo visudo command. That should open up nano (a text editor). Goto the bottom of the file and add this line: bcochran ALL=(root) NOPASSWD: /bin/mount, but replace “bcochran” with your username. That just allows your user to execute the sudo mount command without having to supply a password. You can save the file with CTRL+O, confirm and exit with CTRL+X. The Jupyter service is now updated to the new JupyterLab environment. If you haven’t used Jupyter before, please try it out. It’s a powerful notebook environment for interactive programming. It also includes a fully-featured browser-based command-line terminal, which makes a convenient alternative to SSHing. support for Julia 0.6.2, Python 3.6, Matlab R2017b and R 3.4.2 kernels. · Each notebook is associated with a kernel, you can run multiple kernels simultaneously by starting multiple notebooks. will involve both the conditions running simultaneously while the condition is evaluated. Once the CPU has the answer (say “true”), it scraps the work from the second branch and commits the first branch. The instructions that are executed out-of-order are called “transient instructions” till they are committed. The code in both the branches can do a lot of things. The assumption is that all of these things will be rolled back once a branch is picked. The attack is possible because cache-state is something that does not seem to be rolled back. This is the crux behind both Meltdown and Spectre attacks. Meltdown specifically works because “any-random-memory-access” seems to work while in a transient instruction. This attack allows a program to access the memory, and thus also the secrets, of other programs and the operating system. Reading data from RAM is slow when you are a CPU. CPU cache times are in the order of 1-10ns, while RAM access takes >100ns. Almost any memory read/write is placed in the cache: The cache is a mirror image of memory activity on the computer. The above access results in an error, and raises an exception. However, the attacker knows that the secret is in one of the 5 possible locations. Since only one of these is ever read by the actual program, it can repeatedly run the program and time the exception to figure out which one of the locations was being read. The one which is being read is cached, and the exception will be raised much faster as a result. Cache Timing attacks are the building blocks of Meltdown, which uses them as a side channel to leak data. Intel CPUs allow you to read memory from other processes while in a transient instruction. Step 1. The content of an attacker-chosen memory location, which is inaccessible to the attacker, is loaded into a register. Step 2. A transient instruction accesses a cache line based on the secret content of the register. Step 3. The attacker uses Flush+Reload to determine the accessed cache line and hence the secret stored at the chosen memory location. If you try to actually read kernel-space memory directly, your program will crash. Meltdown works around this by making sure that the memory is only read in transient instructions that will be rolled back. And make sure that check_function always returns false. What happens is that the CPU starts running the code inside meltdown function before it has the result from the check. If you’re wondering why we are doing a read instead of just printing c, or maybe copying it to another place, it is because CPU designers considered that, and rollback those instructions correctly, so any writes cannot be used to exfiltrate the data from a transient instruction. The special condition where c actually is zero is handled in the cache-timing where we notice no memory address has been cached and decide it was a zero. Microsoft have determined that your computer must have antivirus compatible with their new Spectre/Meltdown security patch. If you do not have the correct antivirus installed (and this includes having no antivirus) Windows Update will cease to function as of this month. That’s right if you do not have the registry setting below you will not be getting any windows updates. Microsoft recommends all customers protect their devices by running a compatible and supported antivirus program. Customers can take advantage of built-in antivirus protection, Windows Defender Antivirus, for Windows 8.1 and Windows 10 devices or a compatible third-party antivirus application. The antivirus software must set a registry key as described below in order to receive the January 2018 security updates. In a default installation of Windows 7 SP1 or Windows Server 2008 R2 SP1, customers will not have an antivirus application installed by default. In these situations, Microsoft recommends installing a compatible and supported antivirus application such as Microsoft Security Essentials or a third-party anti-virus application. The anti-virus software must set a registry key as described below in order to receive the January 2018 security updates. In cases where customers can’t install or run antivirus software, Microsoft recommends manually setting the registry key as described below in order to receive the January 2018 security updates. We know that our researchers build upon many free software projects, as we do ourselves. And so, like many institutions, we choose to help with the distribution of this software by providing a ‘mirror’ of the software repositories for as many distributions & projects as we possibly can. Such a service is provided free of charge to our students, and the general public too. You can access files from our new Mirror Service. If your /boot partition is getting filled, you may wish to automatically remove old kernels. I find the best way to do this is to install the yum utilities package and then use a command to delete all but 2 kernels (just in case there is a problem with the latest one). FICO® Xpress Workbench is an Integrated Development Environment (IDE) for developing optimization models, services and complete solutions in a web environment. It is based on ACE, a high-performance web-based code editor, which provides syntax highlighting, code completion and folding, and contextual help for Mosel, VDL, XML and R.
It provides direct support for the authoring, editing, executing and debugging of Xpress Mosel models and FICO Xpress Solutions, using a highly collaborative approach with support for sharing, collaborative editing and chat capabilities. There is integration with Tableau® for FICO, facilitating the drag and drop creation of visualizations and dashboards, and an Xpress Tuner GUI for analyzing and tuning optimization performance. The software licence keys for Maple 2015/16/17 have been released. If you use any version of Maple please contact i.t.request@imperial.ac.uk for the new keys. The MapleCloud now gives you instant, seamless access to a rich collection of user packages that extends Maple’s abilities, and even notifies you when updates are available. The Plot Builder in Maple 2017 has a new design that makes it even easier to create and customize a wide variety of plots, simply and without knowing a single plot command. With Maple 2017, you can find exact solutions to more PDEs with boundary conditions, find new limits, solve more integrals, perform new graph theory computations, calculate more group properties, work with new hypergeometric functions, and much more. Now you can password protect worksheets while still allowing access to the procedures they contain, so you can share your work without sharing your IP. New map visualization tools and a geographical database let you explore and understand world data in a highly visual way. You can give Maple even more information about your problem, and Maple will take these assumptions into account in even more computations, eliminating solutions you don’t need and simplifying results appropriately. In Maple 2017, you can add dynamic plot annotations that will appear when you hover over specific points or curves, so you can convey even more information in your graphs. The Maple Portal for Engineers, which provides a starting point for common engineering tasks, now covers many more topics, includes more examples, and provides sample applications to help you become productive quickly. From performance improvements in core functions, to a more flexible debugger, to new tools that simplify package creation and distribution, Maple 2017 gives you everything you need to develop even complex algorithms and solutions on your own. Enhanced support for statistics and data analysis includes new and improved visualizations, new data analysis tools, and expanded support for data frames throughout Maple, so you can work with and learn from your data. COMSOL Multiphysics is a cross-platform finite element analysis, solver and multiphysics simulation software. It allows conventional physics-based user interfaces and coupled systems of partial differential equations. If you want like to have access to COMSOL please contact i.t.request@imperial.ac.uk to be added to the licence server.